Eating or drinking substances that the donor believes will chemically alter drug test results. Adding substances (salt, vinegar, bleach, detergent, Drano, Visine, etc.) directly to the urine sample to chemically alter test results. Diluting the urine sample, e.g., by drinking large amounts of liquid, taking a diuretic to increase urination, or adding water directly to the specimen to lower the concentration of the drug so that it becomes undetectable by the test. Substituting the donor's specimen with someone else's drug-free urine. How can I guard against adulteration when collecting samples? Direct observation of the donor as he/she provides the sample is a foolproof way to prevent specimen substitution or the direct addition of foreign substances to the sample. However, direct observation is commonly considered an infringement of individual privacy and is rarely done, especially in pre-employment and other workplace testing. Federal guidelines suggest, for example, that donors not be permitted to wear coats or bulky clothing or carry purses when giving samples, that they present adequate identification before giving samples, and that sample temperature be immediately tested. The collection area, usually a restroom, can be secured by turning off the hot water tap, putting a coloring agent in the toilet bowl, and inspecting the area for concealed adulterants. Donors can be required to wash their hands just before giving a sample, hampering their ability to conceal adulterants in the palm of their hand or even under the fingernails. 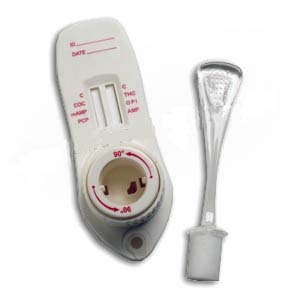 One of the best ways to test for adulteration or dilution is to determine certain urinary characteristics such as creatinine | pH, and specific gravity and to detect the presence of glutaraldehyde | nitrite and oxidants / pyridinium chlorochromate (PCC) in urine.